Since we are reconsidering the value of venture capital, in a world where a startup can raise millions on an ICO white paper written by a freelancer on Fiverr, why don’t we also assess the continued value of the Lean Startup methodology and all the baggage it brought with it? I’ve always had a gripe with how the venture capital community (especially) and, save for the Elon Musk type founders, now lack any conviction about solving any true problems. Founders are starting businesses every day but the system is now set up for them to only focus on solving problems that can be validated by focusing on the lowest ‘Points of Leverage’. It’s time to unlearn the bad lessons that startup founders soaked up from Eric Ries’ ‘The Lean Startup’ and the overuse of the Business Model Canvas.Methodologies that helped VCs squeeze blood from early stage startups before they got any funding? Especially in a world where the problems we now need to focus on solving are Wicked Problems*. Problems which cannot be solved by 180 degree pivots and which cannot be measured using the flawed success metrics created by lean startup worshippers. *Wicked Problems have innumerable causes, are tough to describe, and don’t have a right answer. Environmental degradation, terrorism, and poverty — these are classic examples of wicked problems. Speaking to a couple of founders on Saturday, I couldn’t help but wonder and worry about their blind faith in the ‘Lean Startup’ religion of Steve Blank and Eric Ries. These founders are working on interesting startups solving Wicked Problems. Problems that, frankly, regardless of whether they succeed or not, by traditional venture capital terms, they would have made their dent in this world. And isn’t that what this whole business building thing about? I asked one of the founders how he would validate his hypothesis which is centered around energy usage behavior modification, results of which we won’t truly see for at least 4–5 years. He couldn’t answer but felt (and feels) that if he can’t develop and run an experiment that shows results in a few days/weeks, a la Lean Startup, it might not be worth continuing because he won’t be able to raise funds to continue on a project that is his calling. Here’s a brilliant founder working on a problem with no definitive formulation or stopping rule and, like a lot of founders, is about to stop because we’ve tied the meaning of viable to strictly short term positive economic value. Don’t get me wrong, shame on me for not transferring my knowledge of Lean Manufacturing/Six Sigma to software product development. The same methodology that I’d learned at Warwick University and used to ensure 99.999% uptime in the supply of electricity for half a million London homes. Truth be told, for a bit, I was envious of Eric Ries’ cleverness in taking this esoteric topic and turning it into a startup religion. I’m glad he did because of the waste removed from the startup ecosystem. Wicked Problems and Points of Leverage. With wicked problems, unlike what we call Ordinary Problems (eCommerce platforms etc), there are no trial and error approaches to solving the problem. Every single attempt you make to solve the problem is a ‘one-shot’ attempt with outcomes that cannot be undone. And you never fully solve the problem. This is the opposite of what you aspire to with the build-measure-learn approach of Lean Startups, the outcomes feed into the next stage and you can revert to the previous state if your experiment yields nothing. It’s why, in working on wicked problems, you ‘go big or go home’ by focusing on the highest points of leverage. Intervening at a low point of leverage in a startup would be A/B testing words on a website to solve a perceived customer acquisition problem. Intervening at a high point of leverage in a startup would be a wholesale culture readjustment at a toxic startup or a redefinition of what is considered ‘success’ at the startup. Everything in between — redoing the company website, hiring a team of salespeople, empowering the current team etc- would be considered as varying points of leverage and would have a progressive amount of intervention. Even The Evangelist Is Moving On To Wicked Problems Now. 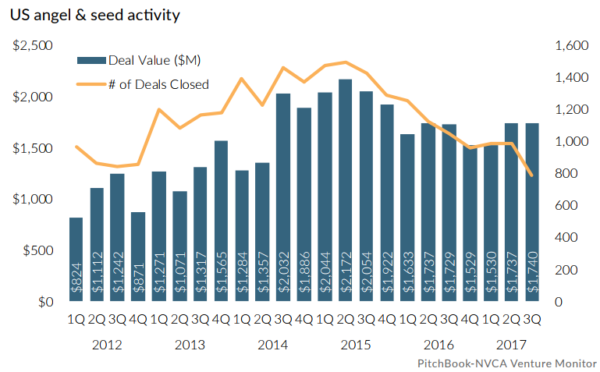 As seed stage funding continues to dry up (image below) startup founders will need to do more to even get considered for the reduced investments seed stage investors will make available. Founders will have to do even more ‘numbers’ to play this game. For investors, it means seed rounds are going to be the place to be. When others leave the market, it is time to get in. Methinks it will be pretty hard to run lean in course correcting a whole ecosystem. Ries has picked the highest leverage point, a paradigm shift from short termism to long-term thinking in capital markets, and my kudos to him. But there are a lot of his disciples still stuck in the ‘A/B-test-your-website-to-death’ approach to building companies.